You’re likely to run into Mari Bartoo Jacobson Saturday – Sunday, June 23 -25 during the Concordia Neighborhood Association Annual Yard Sale. Her business embodies the adage, “One person’s garbage is another’s treasure.” The upcycler uses others’ castoffs to create works of art. 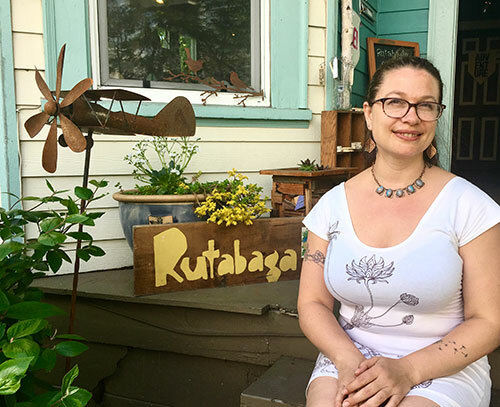 Local crafter and ingenious upcycler Mari Bartoo Jacobson of The Make House’s Rutabaga Redesign is preparing to shop the June 23 – 25 Concordia Neighborhood Association Annual Yard Sale. She’ll be looking for inspiring objects, doodads and diamonds in the rough. A: I‘ve always been keenly aware of our often ugly impact on the environment around us while, at the same time being deeply enamored of the beauty we can bring to light. I endeavor to turn what would otherwise become part of a landfill into something new and interesting. I also love the challenge of uncovering the loveliness of old, grungy metals and woods. Sometimes you really have to look. It’s a lot like finding buried treasure. Q: How did you become interested in upcycling? A: My dad was a carpenter when I was young, and I remember always feeling empowered to build things: tree houses, a rubber band gun, a marimba – those are a few of the things I built with my dad. In my family there was a lot of emphasis placed on “walking lightly on the earth.” So what I do now feels like a beautiful outgrowth of those opportunities and values I was given growing up. Q: Where do you do your work? A: I have a workshop space in The Make House at 1732 N.E. Alberta St. Six other artists and I have workspace in the building, and I also curate a retail space on the main floor called Rutabaga Redesign. My shop features local, handcrafted work from over 50 different artists and craftspeople, myself included. A: Rutabaga Redesign is the name simply because I really like how it rolls off the tongue. Say it out loud. Isn’t that fun? Carrie is a Concordia resident and lives on 29th Avenue. As a freelance writer with a penchant for poetic prose, she tries to look for the humor in everyday life. She also is a mom and world traveler who, with her partner, owns a company that restores and repurposes vintage homes. Contact her at WurdGurl@gmail.com.